However, the sample used in both analyses did not include any measure of contact between populations and was drawn mostly from northern coastal regions of the western North America where intergroup contact was probably common (Balikci 1970; Jordan 2009), but difficult to estimate. If, as the cultural adaptation models predict, frequent contact between groups mitigates the effects of small population size, then the results from these analyses do not provide a test of the models. Using the electronic Human Relations Area Files (eHRAF), Kline & Boyd take a sample of information on indigenous marine foraging tool kits from 10 island societies. This also includes data on the rates of contact between populations and controls for aspects such as resource failure. The general results support the hypothesis in three ways. First, large populations retain a larger repertoire of tools than small island populations (see graph below) — with population size being a much better predictor than other explanatory variables. Second, there is some support for the prediction that contact will be less important in larger populations. For instance, four of the five high-contact societies have more tool types than expected given that they fall within the intermediate range of population sizes. 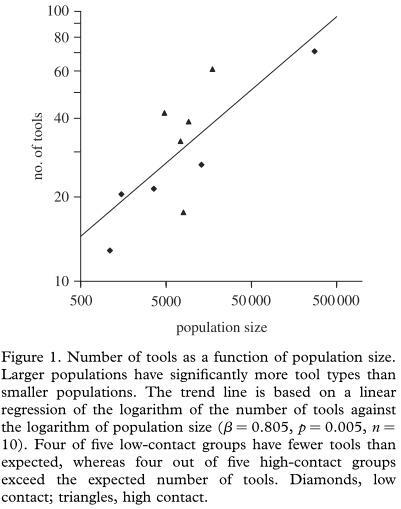 Conversely, low contact groups displayed a trend of having fewer tools than expected, with the overall predictive power of population size and contact being second to population size and fish genera. Their third and final point concerns how complex tools will be particularly prone to loss, due to how much harder it is to learn and make them. To quantify tool complexity, the authors used techno-units: defined as “an integrated, physically distinct and unique structural configuration that contributes to the form of a finished artefact”. As an example, on one end of the scale (one techno-unit) there is a stick used for prying shellfish, whilst an untended crab trap utilising a baited lever is on the end end with 16 techno-units. Applied to the current dataset, and the mean number of techno-units is significantly higher in large populations than in smaller populations. To test this hypothesis, we chose to study island populations because they are ecologically similar and because population size and contact rates are easier to estimate than in continental populations. Then by limiting the analysis to marine foraging tools, we hoped to minimize the effects of ecological variation on tool kit complexity. Thus, our observation that larger populations have more kinds of marine foraging tools and more complex tools than smaller, isolated populations supports the hypothesis that gradual cultural evolution plays an important role in human adaptation. These findings are a first step in understanding the nature of cumulative cultural gains and losses. Although our sample size is small and our analysis is restricted to a limited range of tool types, our results suggest that cultural drift of the treadmill mechanism may have influenced the evolution and adaptive radiation of Homo sapiens as a cultural species. An interesting study – I wonder how many techo-units there are in my laptop. However, I’m wondering whether population size and levels of contact with other groups can be separated. How are groups defined if not by frequent contact? If you’re in frequent contact with a person, does that make them part of your group? Also, the more people in your group, the more contact you’re able to have with other groups. That is, group size and levels of contact may be correlated, so the results here aren’t that compelling. I can see where you’re going with these questions. But, if we agree that a group is a distinct population, in the sense that they show a distinct culture and, perhaps, a distinct genetic profile, then you would expect to see instances where high-contact societies have more tool types than expected based on their population size. So, whilst I agree group size and levels of contact may generally be correlated, I can also imagine certain instances where smaller groups, with large levels of contact, might display levels of technological sophistication that population size alone cannot explain. Yes, fair enough – that seems sensible. However, I was in a discussion of Peter Godfrey-Smith’s new book (reviewed here http://ndpr.nd.edu/review.cfm?id=17047) which reminded me of this. Godfrey-Smith talks about Darwinian populations. What he seems to be suggesting is that the level at which evolution operates on changes as the strengths of various properties of the population change. These properties include the fidelity of heritability, the level of extrinsic influence on reproduction and the smoothness of the adaptive landscape. Cultural traits such as technology are very different to genetic/pheonotypic traits in some ways – the fidelity of heritability is lower and a small change can give an individual a large adaptive advantage (think about lethal weapons). Although I haven’t read the whole book yet, I think Godfrey-Smith is suggesting that this means that the Darwinian Population (the group of things that evolve) changes, from individuals with genes to, perhaps, island-sized groups with techo-units. I’m sure that Kline & Boyd and others would agree with this, but it’s an interesting idea that a population may be defined by the evolutionary pressures working inside it.